Let’s talk a little Christmas in June, shall we? Most families have special holiday traditions, and like many typical Italian families, our traditions have always centered primarily around Christmas Eve. It’s a bigger deal than Christmas Day in our family. Growing up, we would gather with our cousins at my grandma’s house, anxiously awaiting nightfall and Santa’s arrival. Countless years were spent in front of the TV waiting for the local weather man to give a “Santa tracker” update, alerting us to his last known location. We passed the time playing and running around while my grandma, mom and aunt prepared the traditional Christmas Eve feast. Perhaps you’ve heard the lore of the “Feast of the Seven Fishes”? It is an Italian Christmas Eve tradition, where seven different seafood dishes are prepared for the meal. My grandma did it up to the nines. When I was young, the dishes were totally old-school – baccalà, calamari, orange roughy, baked cod, smelts, eel and usually some type of pasta with seafood in it. We showed up at midnight mass reeking of fish! Over the years, with the passing of my grandparents and changing tastes, our menu has undergone some modifications. My mom still makes calamari and either baked cod or orange roughy, but we’ve dabbled in different recipes over the last 5 to 10 years to round out the menu. Two recipes have become mainstays over the last two or three years: crab cakes and coconut shrimp. 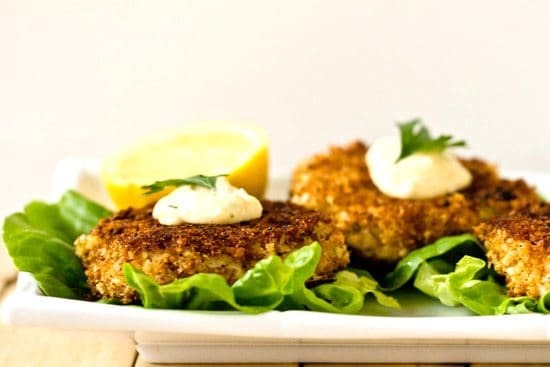 We’ve modernized the traditional meal a little bit ;-) Even though we make them for Christmas Eve, I usually associate crab cakes with summer meals sitting outside near water, beach getaways and warm evenings. So, I thought it would be fitting if I shared the recipe with you now, during the summer! The original recipe uses mayonnaise, bread crumbs and egg as a binder. 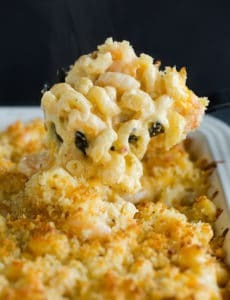 The new recipe uses a shrimp mousse (fresh shrimp ground with heavy cream) as the binder. The original recipe used only scallions as the vegetable flavoring. The new recipe uses finely minced celery, onion and garlic that has been sauteed in butter. 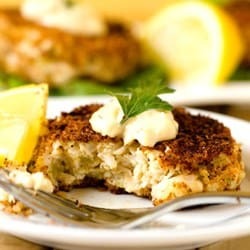 The original recipe calls for dredging the crab cakes in flour and then pan-frying. 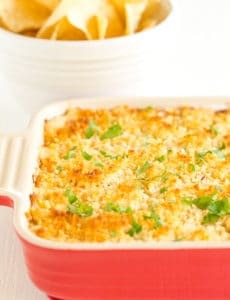 The new recipes uses a coating of toasted panko bread crumbs. The new recipe is more involved and takes a little longer to prepare, but the final product is worth every single solitary second you spend in the kitchen. These crab cakes are absolutely phenomenal. My mom and Chief Culinary Consultant taste-tested them with me and we couldn’t get over what a tremendous punch of flavor there is. Shrimp and crab are a natural seafood combination, so using the ground shrimp as a binder is totally logical. It provides a meatier texture and a more pronounced seafood flavor, without the least bit of a “fishy” undertone. The rémoulade sauce served alongside is the perfect accompaniment – it’s creamy and has just enough kick. My mom declared that this recipe has officially replaced the old one in the cherished Christmas Eve menu file. I think that says it all, right?! Make the Rémoulade Sauce: Pulse all ingredients except salt and pepper in food processor until well combined but not smooth, about ten 1-second pulses. Season with salt and pepper to taste. Transfer to serving bowl and refrigerate until ready to serve (the rémoulade can be refrigerated for up to 3 days). 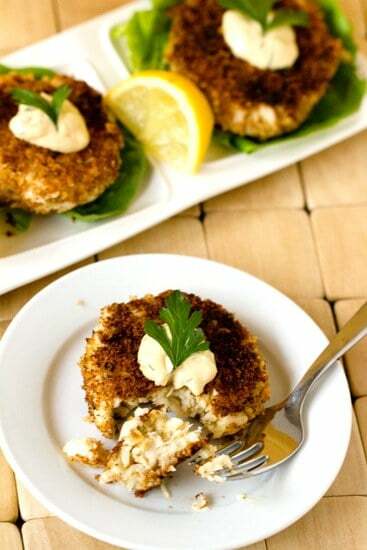 Make the Crab Cakes: Place ¾ cup panko in small zipper-lock bag and finely crush with rolling pin. Transfer crushed panko to 10-inch skillet and add remaining ¾ cup panko. Toast over medium-high heat, stirring constantly, until golden brown, about 5 minutes. Transfer panko to shallow dish and stir in ¼ teaspoon salt and pepper to taste. Wipe out skillet. Pulse celery, onion, and garlic in food processor until finely chopped, 5 to 8 pulses, scraping down bowl as needed. Transfer vegetables to large bowl. Melt butter in now-empty skillet over medium heat. Add chopped vegetables, ½ teaspoon salt, and 1/8 teaspoon pepper; cook, stirring frequently, until vegetables are softened and all moisture has evaporated, 4 to 6 minutes. Return vegetables to large bowl and let cool to room temperature. Rinse out pan and wipe clean. Pulse shrimp in now-empty food processor until finely ground, 12 to 15 pulses, scraping down bowl as needed. Add cream and pulse to combine, 2 to 4 pulses, scraping down bowl as needed. Transfer shrimp puree to bowl with cooled vegetables. Add mustard, hot pepper sauce, lemon juice and Old Bay seasoning; stir until well combined. 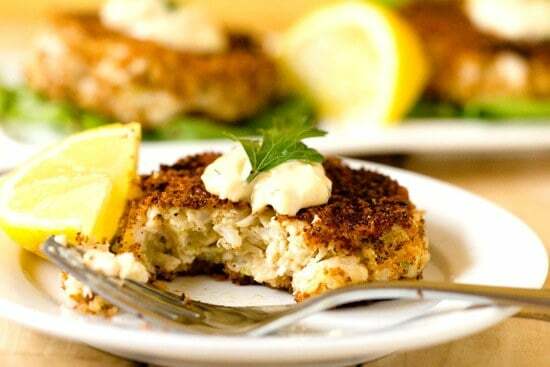 Add crabmeat and fold gently with a rubber spatula, being careful not to overmix and break up lumps of crabmeat. Divide the mixture into 8 balls and firmly press into 1/2-inch-thick patties. Place cakes on rimmed baking sheet lined with parchment paper, cover tightly with plastic wrap and refrigerate for 30 minutes. Coat each cake in panko, firmly pressing to adhere crumbs to exterior. Heat 1 tablespoon oil in now-empty skillet over medium heat until shimmering. Place 4 cakes in skillet and cook without moving them until golden brown, 3 to 4 minutes. Carefully flip cakes, add 1 tablespoon oil, reduce heat to medium-low and continue to cook until second side is golden brown, 4 to 6 minutes. Transfer cakes to platter. Wipe out skillet and repeat with remaining 4 cakes and remaining 2 tablespoons oil. Serve immediately with the rémoulade sauce and lemon wedges. I much prefer the original recipe. There crab cakes look delicious. It’s a dish I often order when I go to King’s Fish House. I love crab cakes. I’d be curious to try both those recipes you mentioned side by side. This is a fantastic recipe! I wonder if they can be made ahead for a party and frozen? would you recommend freezing the uncooked ones, or cooking and then freezing? Thanks! Hi Mark, I have made these a day in advance and refrigerated them with no issues, so I think freezing uncooked would be just fine. Is shrimp cooked or raw? Saw from other comments that it’s raw. Recipe looks really good. Thank you. I saw in a reply you made above they are raw shrimp. Can’t wait to make them! Made these for a dinner party last night…they were absolutely fantastic. I made them small (like little meatballs) and served with a few greens and they were an absolute smash. 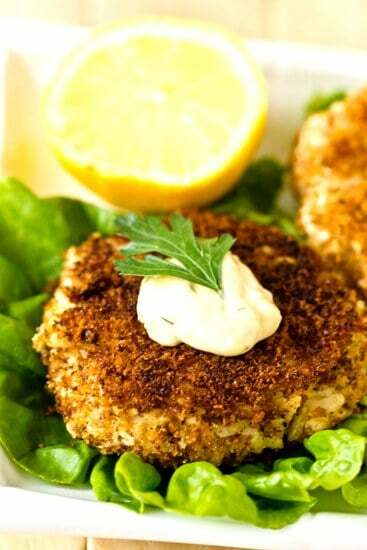 Fantastic flavour and not heavy like traditional bready crab cakes… I made a few without panko and they were carb free. Extra bonus! 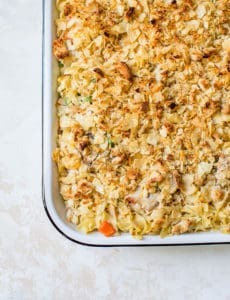 I am also happy to say that I did make them ahead of time and reheated in the oven….I made them just before the crowd arrived so I didn’t need to refrigerate, and they were utterly delicious. This one is a keeper! Cook’s Illustrated does not give away this recipe without payment. Should you be reposting it for free? I made these crab cakes and your coconut shrimp for a family get-together. They were beyond amazing! The crab cakes were my personal favorite, and I could have eaten the remoulade sauce with a spoon. Thank you so much for doing this website. I love your recipes. To be honest, I consider myself a very skilled baker, and I have a pretty good understanding of flavor. I find your recipes to be truly spectacular. You do consistently great work, and I appreciate it. You have been the secret star of many of my family events. hi there, I’ve made this about 3 times. what is the secret to getting them not to fall apart. Hi Melissa, Make sure you pack them tight, and then don’t try to flip them until the first side is set. turn over in the pan without them falling apart – did any one else experience this problem when they made them?? Made these with my boyfriend last night. All I can say is wOW!!! So much better than anything I’ve eaten in a restaurant. We couldn’t bring ourselves to pay $35 for a pound of lump crabmeat, so we used claw meat and it was absolutely delicious. Bravo! Will definitely make these again. Do you think I can cook these in advance and then reheat in the oven when I am ready to serve? I am bringing them to someone for Thanksgiving and need to make in advance. Thanks! Hi Katia, I’m not sure how far you need to travel, but I would recommend forming the crab cakes, placing them on a baking sheet wrapped in plastic wrap and chilling them. Then, cook them right you are ready to eat. They will not taste the same if they are cooked, cooled, chilled, then reheated. Do you think I could form them on Tuesday and then bake on Thursday morning? (I am only traveling around the corner. :)) Or should I form and freeze and then cook on Thursday morning. I am gone all day Wednesday, so that is why I wanted to do everything on Tuesday. Thanks! Hi Katia, I would not refrigerate them for 2 days, so it looks like your only option is to freeze. It should work, but I have never frozen the crab cakes, so I can’t guarantee how they will thaw. Please let me know how it goes! Hi there, Unfortunately, I can’t. You should see something that says “manage subscriptions” around the comment box where you can then deselect any posts you are subscribed to. I made these for our New Years Eve feast. I often order crabcakes when out.. these are the BEST I have ever had, even tho I had to make them myself! They’re all crab! no fillers or breadcrumbs! WONDERFUL!!! I will definately come back to these again! Thank you for a wonderful 2012 worth of recipes looking forward to 2013!